We started consulting the athletes at Liverpool, interestingly, whilst Robbie Keane was still there. We chatted with Keane and Torres, and then we took it over to Manchester to speak to Rooney and Rio Ferdinand. After England, we took it onto the continent to speak to some of out European athletes. Rino (Gennaro) Gattuso from Milan was a very interesting character, something of a budding designer! He gave us some very strong feedback on how the shoe should look; suggesting it should have a very aggressive personality and how to capture that in the design. He also mentioned the lacing as well, he was insistent that it should have a very clean striking area. Torres provided the most to talk about. He marked out 3 ‘zones’ on the foot which he used for different finishes, paying particular attention to the inside of the foot for curl and the top of the instep for striking the ball. Previously, we’d always spoken about the T90 message being ‘Put it where you want it’. When we took in all the feedback from the players and some research and development; we thought we could add another dimension to it; and start talking about ‘Put it how you want it’. Keeping the focus on accuracy, but giving the player different types of kick. It’s a common conception, that for an accuracy shoe it’s all about friction. If you put something grippy on the upper you’ve got yourself an accuracy shoe. We looked at this in more detail and how this influences different types of kick. When applying swerve to a ball, there’s a very clear relationship between the level of friction and the chance of error. The more friction you apply the lower the error. When we look at players kicking the ball, we found there were two types of common kick, if you like – kicks using sidespin and kicks using topspin. So we looked at how the friction area of the shoe could best be designed to maximise those two types of spin on the ball. We toyed around with different levels and different heights of lumps and bumps over the shoe, trying different heights and different directions of those to get the optimum application of spin to the ball. We settled on fins, ranging from 0mm, up to 3mm and then back down to 0mm again. These collapse on contact with the ball – so the ‘plateau’ of fins gives you a larger surface area making contact with the ball. Our research showed, that when striking through the ball – trying to apply power – we found there was, in fact, no relationship between friction and that sort of instep accuracy. 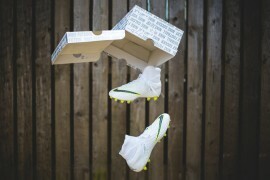 Firstly, the laces are moved to the side for a clean kicking area. Then we have longitudinal pods made from injected silicon, which gives you a smooth contact area when you kick it from anywhere; from the ground, on the volley this is a very consistant area giving an optimum transfer of energy. We knew from the research we did into the Laser I & II’s that a flatter kicking surface would give you better accuracy when striking through the ball. What we wanted to do was fill out the void [between the uneven spaces along the tops of the toes and the boot. Across different styles and types of kick we felt it was important to make this area as flat as possible, to create a strong transfer of energy from the foot to the ball via the boot. 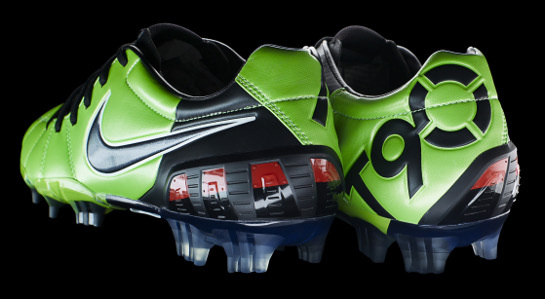 Unlike previous Total 90’s the area underneath the fins, is composed of KangaLite (Ed: which you may remember from the CTR360) which gives optimal comfort and feel for the ball, and the synthetic material is a Teijin material (Ed, again: which you will know from the Vapor line). We also gave it a new finish across the upper of the shoe, what this does is it gives you the same durability as the Laser II’s, but it’s 22g lighter and softer. Under the KangaLite, there’s a memory foam layer that moulds to the top of the foot so there’s no void which I talked about before, which translates into a perfectly flat area on the top surface of the boot. 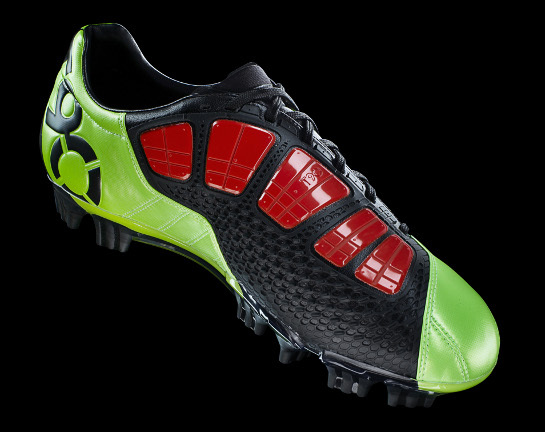 We wanted them to stand out; higher on pitch visibility across 360 degrees. 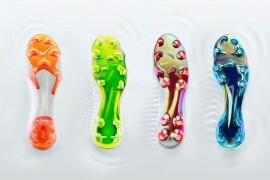 We also wanted to the technology used on the boot to pop out as well. We feel we’ve got a very strong technology message, and we want it to be visible. We also wanted to run the shoe a third ‘impact’ colour. Previously we’ve only done two colour shoes and we wanted to give these a third ‘pop’ colour. You know – they’re not actually as bright as I thought they’d be! I thought I was going to see the prototype for the first time and think ‘Wow, I’m gonna have a tough time pitching this to the rest of the guys!’. 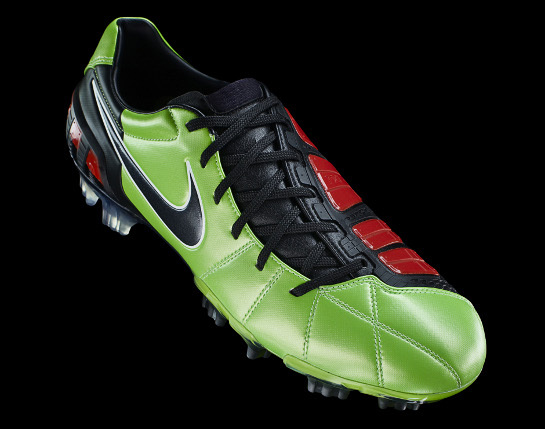 But on the pitch, I think with grass, they look great! It’s funny; I’ve done focus groups for a while now. A few years ago people wouldn’t even think of wearing anything other than black boots. Now, when I show the product to younger audience, they want any colour in the world except black! Thanks to Chris from the whole Footy Boots team for spending so much time with us and for a fascinating insight in to boot development. Next articleTOTAL 90 LASER III: A DAY IN THE LIFE…..
great article again! you can really see and appreciate how they develop the boot.